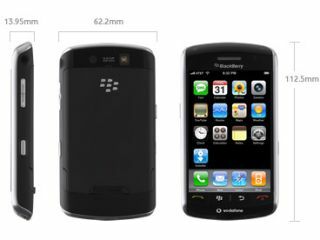 An iPhone AND a Blackberry? What upside down world do we live in? Vodafone appears to have made a bit of a BlackBerry boo-boo by running pictures of the new Storm handset with an iPhone OS running on the screen. Fans of both handsets have been perplexed over the fusion, which might mean that the two biggest names in mobile emailing (well, sort of) could have finally put aside their differences and have come up with a beautiful union. Oh, we've just found out that Vodafone has taken down the picture. Boo. Thankfully, ValleyWag managed to snaffle a screen grab of the specification screen complete with iPhone-goodness, which shows the handset hybrid some fanboys could have only dreamed of. Unfortunately, it's clearly not to be, and we are pretty sure that a web designer out there is currently being strung up and flogged with a QWERTY keyboard as penance for such a sacrilegious act.